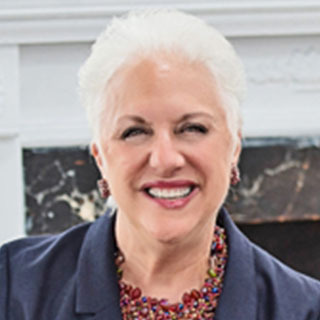 Hazel Goldman and Evan Goldman - Dynamic Pinecrest Real Estate Sales Team. Pinecrest dates back to the first residences there in the 1950’s when large lots were plentiful and the area seemed far south of downtown Miami. Consequently large lots are found here with sprawling residences and a rural atmosphere with few sidewalks. Hazel is proud to have been one of the original members of this Village which she pro-actively helped form with the initial mayors of the area, Evelyn Greer and Gary Matzner. This group of Pinecrest area residents requested a village government in order to protect its large land zoning from being turned into smaller lots and its half-acre and acre zoning compromised. 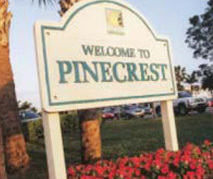 Thus, the Village of Pinecrest was incorporated in 1996 and its popularity and desirability as an enclave for families to reside has continually increased in part due its safe neighborhoods and zoning restrictions. However, the main attraction of this area is the schools. The best public schools probably in the state of Florida, as well as some of the areas best private academies, make this one of the most coveted areas for young families with children. Its three elementary schools: Pinecrest, Palmetto and Howard Drive. Palmetto Middle School and nationally recognized and highly rated Palmetto High School. This very special hometown community is the best of suburbia with an urban Miami lifestyle, located approximately 15 miles south of downtown Miami and 20 minutes form the Miami International Airport. This affluent area has a low crime rate, peaceful tree lined streets, a wonderfully responsive local government and police force, glorious parks, and a friendly casual atmosphere. Its half-acre and area executive homes are available in a wide range of prices. Pinecrest encompasses approximately eight square miles and is recognized as one of the most beautiful residential areas in South Florida. Pinecrest Gardens is the new jewel in the crown of this community. On 20 acres of hammock land, this site was the former Parrot Jungle since 1936 until 2002 when the attraction moved to Watson Island on Miami Beach. At that time, Pinecrest purchased this historically significant property and developed the site, Pinecrest Gardens, opening this municipal park in 2003, with a new recreation center as well as the original improved structure and the magnificent gardens. There is something at Pinecrest Gardens for children and adults of every age including: a water playground, petting zoo, playground, picnic areas, feed the fish experiences, botanical gardens with beautiful and rare plants, a swan lake with iguanas, turtles, cranes and other native birds, movie nights, all kinds of entertainment in the Parrot Bowl, classes ranging from botany, to fitness, to languages, as well as a wonderful Farmer’s Market on the weekends. Cocoplum, this Arvida-developed exclusive residential water's edge enclave boasts luxurious homes on a series of private islands with easy direct access to Biscayne Bay and the Atlantic Ocean. This private lush community enjoys outstanding security and its own private full service marina and dockmaster. The well-equipped clubhouse offers many amenities including tennis, a basketball court, large pool, playground, and gym. Most homes here are on cul-de-sac streets and on lots of 10,000 square feet and under. Deering Bay is an exclusive secured community at the southern end of Coral Gables. The entire community sits on 145 acres and is set around a challenging Arnold Palmer 18-hole golf course with water on 3 sides. Deering Bay Yacht and County Club has a tennis center as well as 3 marinas, and a beautiful clubhouse with every amenity desired. 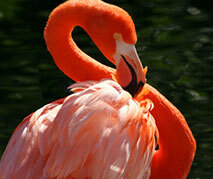 The community includes a wild bird sanctuary and is naturally very beautiful. 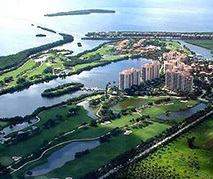 Deering Bay features high and low rise luxury Mediterranean styled apartments, villas, townhomes and a small number of private homes all of which enjoy a beautiful bay front location and a country club lifestyle. This community lies in the Pinecrest-Palmetto school district. Gables Estates is a quiet waterfront community of high quality sophisticated homes nestled on the water in the southern part of Coral Gables. This exclusive waterfront community encompasses more than 200 acres on Coral Gables' shoreline. Gables Estates features private secured mansions each on over one full acre of land making this a unique community and often the home of the rich and famous. It is recognized as one of South Florida's most prestigious and expensive neighborhoods due to its location, lot sizes and water proximity. Developed originally in the early 1960's by renowned industrialist Arthur Vining Davis, this secure community encompasses 192 lots (there are only 170 homes) with wide, deep water, sea walled canals which wind their way through magnificent estate homes. Homes in Gables Estates are located on canals with direct access to Biscayne Bay or fronting Biscayne Bay proper. Membership in the gated Gables Estates Club, Inc. is a prerequisite to purchasing property. Miami’s Gables Estates combines prestige, privacy and security for an unrivalled quality of life for today’s wealthy elite. Gables by the Sea is Coral Gables’ southern most community. As its name implies, most of the homes here are on man-made canals, which lead out to Biscayne Bay. This is a community of exclusively single-family homes all of which are in the Pinecrest school district. The majority of these homes have private docks. 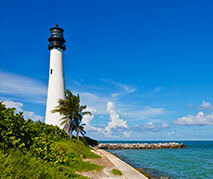 Gables-by-the-Sea is south of both Miami Beach and Key Biscayne and not far from the Florida Keys. 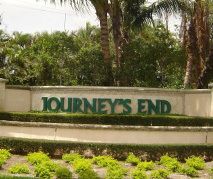 Journey's End is a small exclusive community just south of Gables Estates on Old Cutler Road. This community contains 18 estates on gorgeous foliated property known for its magnificent oak trees, which was once privately owned by Arthur Vining Davis. 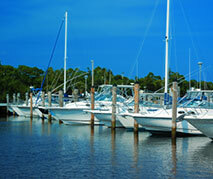 This community has excellent guard-gated 24-hour security and a marina with boat slips. 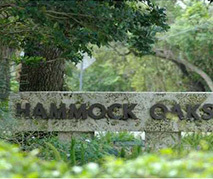 Hammock Oaks is an exclusive community on Old Cutler Road, which borders both Matheson Hammock Park and Fairchild Tropical Gardens. This is a community of man-made lakes with some Bay front properties, all of which are in the Pinecrest school district. 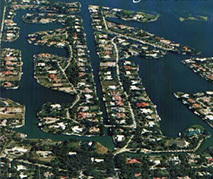 Old Cutler Bay is another 24-hour guard-gated waterfront community of 136 homes just south of Gables Estates on Old Cutler Road. 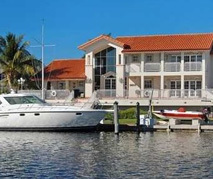 Most of the homes here generally sit on builder’s one half-acre lots on canals, which connect to Biscayne Bay and the Atlantic Ocean. 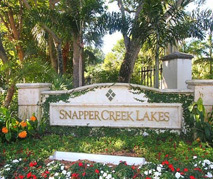 Snapper Creek Lakes is another guard-gated prestigious community with a private, full service marina with dock master, boat slips and one bridge to the bay. It is on the west side of Old Cutler Road. The 124 homes in this extremely bicycle and child-friendly community each sit on at least a full acre of lushly landscaped property, which is a natural hammock. Neighborhood peacocks stroll through the winding streets and complement the surrounding natural beauty. A bike path over the Snapper Creek Canal makes Pinecrest Elementary School on Red Road very easily accessible. The community has a man-made lake but unlike the other marina communities this one looks more like a community you would see in Connecticut or New York. Tahiti Beach is one of Miami’s most sought after residential addresses. 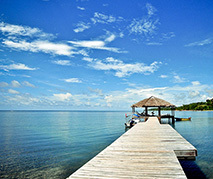 It is the most exclusive part of Cocoplum with the largest lots. This area has a separate guard-gated entrance, a private park, sandy beach, and tennis club shared by the homeowners of the 29 properties within this community within Cocoplum. This is an exceptionally secure coveted community and most its homes have private boat docks and backyards overlooking Biscayne Bay. Miami's own "city beautiful," Coral Gables has it all. The city was developed by George Edgar Merrick during the Florida land boom of the 1920s and was one of the first fully planned communities in the United States. Merrick incorporated secluded residential enclaves and commercial areas inspired by the architectural style of the Mediterranean. The city is still noted for its strict zoning. International offices, banking and restaurants, theatre, historic estates, canals, fountains, manicured golf courses and country clubs as well as graceful old oak trees all reflect the finest classical Florida style of living. 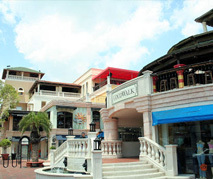 Fabulous shopping abounds from the Village of Merrick Park to the boutiques lining downtown Gables. The Biltmore Hotel, the centerpiece of this city, reminds us of a bygone era of luxury and grace. Coral Gables is also home to the University of Miami, which sits on 240 acres. Coral Gables provides residential opportunities from the downtown condos to sprawling acres estates, with just about everything in between, including the luxury of waterfront living and access by boat to Biscayne Bay and the Atlantic Ocean. The streets are tree-lined and beautiful with an abundance of shade and walking paths. Coral Gables has lots of parks, ball fields, a wonderful library and community center. Below we have highlighted some of its most exclusive gated residential communities. Coconut Grove is the village within the City of Miami, which represents the historical heart as well as the best of Miami's past emerging with Miami’s future. 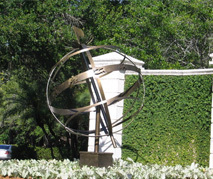 Located between Coral Gables and downtown, the area has been known to attract artists, authors, and musicians. Today, the Grove has been transformed into a vibrant community on the Bay with fabulous shopping, restaurants, outdoor cafes and renowned private and parochial schools. 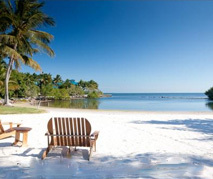 Wonderful full service marinas and parks hug Biscayne Bay in this wonderful and walk-able village. This premier location offers distinctively unique properties set in grand gardens with umbrella banyan trees and cool bay breezes, luxury hotels, condos, and fabulous residences. A revitalization of the bay front area is currently under way with noted luxurious bay front condos in the making. Most distinctively, the Grove is noted for its canopy of lush mature trees and gardens. The main single family areas here are the areas on either side of central or downtown Grove, north Grove just south of Brickell Avenue near Mercy Hospital and Vizcaya Museum and the South Grove, adjacent to South Miami and Coral Gables. After watching the success of its sister village Pinecrest to the north and the escalation of property values there, Palmetto Bay recently incorporated in 2002 to become Miami’s newest Village to its south. This area shares Palmetto High School with the Village of Pinecrest. Its two elementary schools: Coral Reef and Perrine feed into Southwood Middle School which with Palmetto Middle feed into Palmetto High. This area offers a large variety of executive one-half acre homes on peaceful cul-de-sac streets and in child-friendly park-strewn neighborhoods but lower in price than in Pinecrest. This wonderful suburban area offers a high quality of suburban family living. 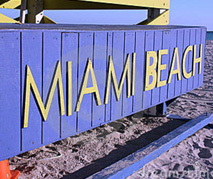 The City of South Miami is a suburban city, located west of Coral Gables and north of Pinecrest. It is home to the Shops of Sunset, has a wonderful main street feel of the Sunset and Red Road shopping areas and cinemas, and includes beautiful acre neighborhoods of Ponce-Davis and the friendly charming homes of High Pines. This is a community rich in diversity, wonderfully located and constantly changing. South Miami's central business district is directly served by the Miami Metrorail at the South Miami station on Sunset Drive, connecting the suburb to downtown Kendall, Downtown Miami, and Miami Central Station at Miami International Airport in 2012. Although often lumped together with the City of South Miami because of their geographic proximity to one another, both the High Pines and Ponce-Davis neighborhoods are subdivisions of unincorporated Miami-Dade County and not part of any city or village. Both are single-family neighborhoods: The High Pines area is a family friendly, very desirable and reasonably affordable neighborhood with lots no larger than 12,500. South Miami is easily accessible by foot from here . 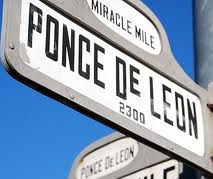 Ponce-Davis area is named for the streets, which intersect it: Ponce de Leon Blvd. (SW 47th Avenue) and David Road (SW 80th Street). This area is adjacent to the High Pines on the west, to Coral Gables on the north and east, and to Pinecrest on the south. Unlike High Pines, it is distinctively known for its large, beautiful acre lots and lavish custom homes. It is a quiet and beautiful neighborhood. City of Miami Beach Strewn along more than 10 miles of the Atlantic Ocean, the vibrant City of Miami Beach boasts world-class beaches, a historic Art Deco District, and fabulous South Beach. Its incredible nightlife, restaurants, clubs, hotels, shopping, and aura have made it the international playground of the world and one of the most desirable places to live and play. It provides a seamless intersection of both nature and glamour. Some of the most fabulous island residences, waterfront private homes and condominiums are offered here, as well as a world of attractions including theatre, art shows, symphony orchestra, the Jungle Island, The Children’s Museum, marinas and world class golf. 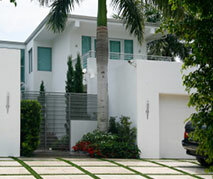 Miami Beach offers waterfront homes, large and small properties and houses located on golf courses. The area also has many condos with spectacular views of the Atlantic Ocean, the Intercoastal Waterway and the downtown Miami skyline. It offers the opportunity to live in both an urban environment within walking distance to Lincoln Road, Surfside or Bal Harbour as well as the chance to live on exclusive private island communities such as Palm, Star, Allison, DiLido, Sunset, La Gorce, Hibiscus, San Marco, Rivo Alto or on exclusive Fisher Island, only accessible by ferry. Miami-Dade County includes many distinctive and unique residential communities. Some are cities, incorporated villages, and others are simply notable areas for residential real estate. Hopefully these descriptions and maps will help acquaint you with the ones in which Hazel and Evan have profound expertise. The areas are presented here from north to south and are all part of Miami-Dade County. 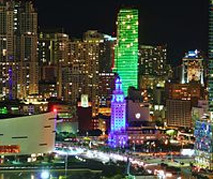 Biscayne Boulevard is the described center of downtown Miami, home to the American Airlines Arena, Bayside, Bayfront Park and the Performing Arts Center. It runs from the north end of Brickell Avenue up Biscayne Boulevard, which is now becoming Miami’s Fifth Avenue, across from the Bay and with views of the Miami Beach skyline and the Seaport. Architecturally distinctive office buildings now share this avenue with some of Miami’s most exclusive condos. Nightlife is heating up as new restaurants, bars and nightclubs are pouring into this area. The People Mover and Metrorail now connect our downtown to the Miami International Airport, truly complementing an urban lifestyle. 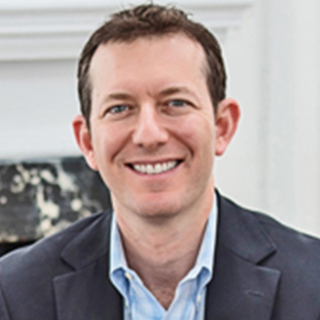 The Upper East Side (also known as Northeast Miami or Morningside) is a re-gentrified neighborhood in the city of Miami along Biscayne Bay just north of the center of downtown. It is primarily a residential neighborhood composed largely of historic single-family homes from the 1920’s. This area includes Miami’s “Design District” with is comprised of historic hotels and buildings from the 1950’s and 1960’s preserved and now being renovated and turned into stores, restaurants, art galleries, and boutique hotels. 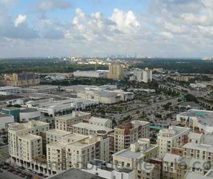 Midtown Miami, a new mixed-use neighborhood of condos, restaurants, shopping malls and theatres is also found here. 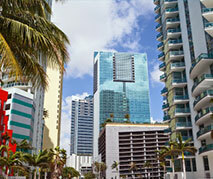 Miami is a cosmopolitan metropolis and the financial and business gateway to South and Central America. Downtown Miami is experiencing a whirlwind gentrification. It is a world-class urban center with increasing public transportation, world class shopping, entertainment and dining. The NBA World Champion Miami Heat play at American Airlines Arena on Biscayne Bay and minutes from Miami’s World Class Seaport and Cruising Center, which is also home to many concerts and the yearly Ringling Brothers Barnum and Bailey Circus. The Miami Marlins are now playing in a brand new ballpark in the heart of the City. The Adrienne Arsht Center is the home of the Miami City Ballet, Miami Opera, Broadway productions, the Miami World Symphony, regular performances of the Cleveland Orchestra, as well as a jazz concert series, dance series, Summer Short plays, and practically any type of imaginable entertainment. Museum Park, Bayside and Bayfront Park all hug Biscayne Bay and are open for everyone’s enjoyment. Dadeland is Miami’s fastest growing newest residential community just entering the condo marketplace with a burst of new luxury communities. Anchored by one of the best shopping centers in the world, the Dadeland Mall, and at the start of the Metro Rail System south of the City of Miami, this area offers everything: good schools, easy access to all expressways, great restaurant choices, and is fast becoming the City of the southern suburbs.. The Village of Key Biscayne, described by its residents as an “Island Paradise” is located a few miles east of the mainland, south of Miami Beach, and is a quiet community close to the excitement of urban Miami. Key Biscayne has extraordinary beaches, two wonderful state parks, unparalled natural beauty, luxurious hotels and beach clubs, as well as world-class tennis. However, with its village square and size, it still maintains the feel of a small town. Fabulous condos and estate residences, many of which are on the beaches and waterfront can be found here, as well seasonal rental opportunities.